One of the most frequent requests we receive is for more tutorial videos on how to use World Machine. I'm happy to announce a great new 3rd party resource for your training needs! Vladimir from Geekatplay Studio has just released a set of tutorial videos on World Machine. 4 videos are freely available now, out of a total of 29 that will be unlocked weekly. I have reviewed the videos and found them to be a great introduction to using World Machine. He plans to release more videos in the future covering deeper and more advanced features as well. Always been a big fan of GeekAtPlays videos, will get this set for sure. Exploring WWM series two - project based ...more tutorials. i am adding workflow with other applications. Tutorials free to watch, i will unlock new every week. Your feedback very appreciated. Tell me subjects you are interested, what should be cover in tutorials. @Remnant: Any idea what is so special in Dax's "proprietary Snow Distribution Device" and if something like that will be coming to World Machine ? Purchased the Exploring World Machine set. As usual, always a very high standard in terms of knowledge sharing and explaining those details that just makes your project that better. This is what I always loved about GeekAtPlay. A little thing that came to my mind and that I would have loved: To see the final product in World Machine before exporting maps to VUE. Many of us don't use VUE and will instead export to other packages. So to have the tutorial kind of reaching its "peak" at the end of the WM session would be SO cool, spending a little time reviewing what has been accomplished with WM, reviewing the techniques and discussing the final result would be much appreciated. Then the second part could still be importing and rendering in VUE - and those who don't use VUE would still be able to follow along and transfer the ideas to our rendering-engine of choice. I tried reduce of Vue use, but sometimes it's needed for renders. Actually I am using Blender internal and 2 months ago I wrote a minimal tutorial. I know the scene is rather basic, but it's just a matter of keep working on it. @WFab: Yeah, Cycles isn't quite there yet. But I recall volumetrics will be coming with Blender 2.7. Blender Render (former Blender Internal) is not hard to deal with. What version of Blender are you using? @motorsep: i'm using blender 2.68 at the mo. if 2.7 has volumetrics and true displacement in cycles, it would be unbeatable in terms rendering terrains. @asierra: i used the same workflow as your tutorial, the problem isn't importing the displacement... problem is adding details, like procedurals of cycles, or importing a 4k or 8k displacement. blender crashes every time. my gpu is not supported for gpu acceleration in blender. even if i manage to bring all that into blender, the renders don't look that great, neither do my projections. Coming soon, World Machine and Terragen 3. 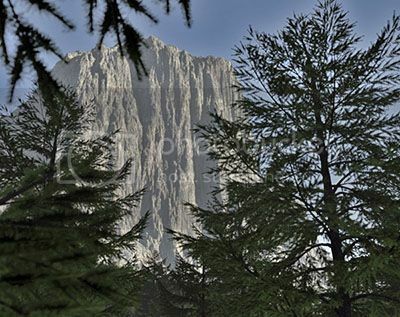 Any one here using Terragen ? I don't. What can Terragen do that WorldMachine can't? I can actually answer that one -- WM is not and has never been designed to be a terrain renderer. Our focus is squarely on terrain modeling; using the output in 3D rendering software (be it Terragen or Max...) is quite a natural desire. havent really gotten around to figuring out how to use masks rendered out of WM as surface layers in terragen yet, they always seem to break on me..
Purely in terms of terrain creation, WM has much prettier outcomes IMHO, what with the erosion node and all, but Terragen can, if you go out to such a scale, render out the planet's curvature into the terrain, (which if you do enough research into map projections turns out to be quite important http://www.youtube.com/watch?v=2lR7s1Y6Zig, http://xkcd.com/977/) along with protusions and holes in the terrain (because of WMs heightmap limitations. It really depends on what you need to do as to which would be the better option, but for me using a rendered heightmap from WM as a foreground and Terragen power fractals as the BG terrain seems to get the best of both worlds. i plan on switching to terragen. an in depth look at terragen workflow with wm would be great. thanks in advance!!! I'd certainly vote with my credit card for such a series from geekatplay!